Hot melt coating is a process in which molten lipid excipient is sprayed on to solid particles in a fluid bed coater. The lipid solidifies upon cooling and coats the particles with a thin, homogeneous film. This process can be used for taste masking, protection of sensitive APIs, or modification of drug release profiles. 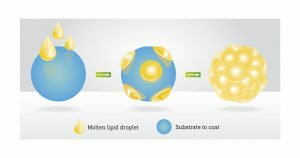 Gattefossé carried out an in vivo study in human subjects comparing the bioavailability of lipid-coated (Precirol® ATO 5) and uncoated acetaminophen. The results showed that the lipid coating has no impact on bioavailability. Contact Gattefossé to get the study.